Because of the low rigidity of thin-walled parts, the cutting vibration is commonly encountered and has a vital influence on machined surface quality. Theoretical simulation of surface topography is one of the main methods to evaluate and control surface quality in practice. In this paper, a simulation model of surface topography is developed based on cutting edge motion model that incorporates the dynamics of thin-walled parts milling system. The theoretical model used to describe the trajectory of cutting edge takes tool vibration and workpiece vibration into account. Then, the influence of system vibration on surface topography is investigated. 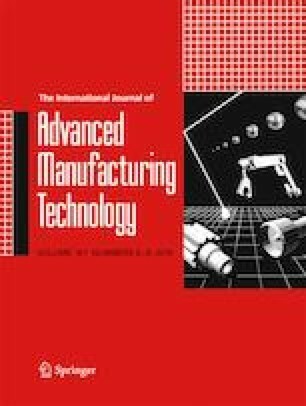 Particularly, a new method is proposed in this paper to predict the texture interval, texture distribution, and residual height for different milling areas by identifying the dynamic characteristics of thin-walled parts. In addition, the validity of surface topography model is conducted by experiment. The results show that the simulated topography is consistent with the experimental topography, and the model is proved to be able to predict roughness accurately. This work was supported by the National Natural Science Foundation of China (No. 51775280 and No. 51675285), and the National Science and Technology Major Project (2013ZX04002-011).